Finally, after five concept cars, a ton of screaming and stress tears, and plenty of stagnant potential, Volkswagen seems interested in bringing the latest I.D. Buzz bus concept to production by 2022. You can’t tell, but I’m definitely cautiously squinting right now. The latest VW Microbus concept debuted at the Detroit Auto Show earlier this year, and we hounded anyone at the automaker’s stand we could find to just go ahead and build the damn thing already. Apparently that totally worked, and we deserve all of the credit for sure, don’t doubt us, because Automotive News reports that VW brand chief Herbert Diess is ‘a fan’ of the return of the iconic Bus. 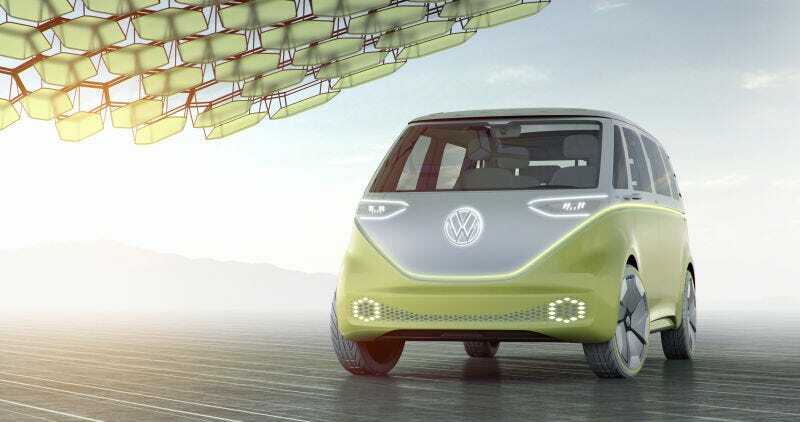 According to the report, VW sources claim the production model could easily be distinctly close to the design of the concept, interpreting the classic 1950's T1 Microbus on the automaker’s new MEB architecture, meaning it would get an electric powertrain. Diess wants it. You want it. I want it. Jason Torchinsky can’t sleep at night. If things are really, really a-go, well gosh, I guess I’m buying a van. Five years is a bit of a haul, but if the VW brand is still hurting from all of its Dieselgate troubles, bringing back one of the most culturally significant models of all time probably will make things better. Let’s just hope Tesla doesn’t beat VW at their own game.